43, of Unity, Maine; assigned to the 133rd Engineer Battalion, Maine Army National Guard, Belfast, Maine; died March 3 in Syracuse, N.Y., of a non-combat-related illness after returning from duty in Iraq. I can remember the first day that we met when I started working at Camp Keyes years ago. From the onset you were so kind and the first to share your knowledge with me as I just began my job there. You fielded all of my questions, and there were a lot… The main thing that sticks out in my mind is that you would start every day with a warm hello to everyone in the office. I am so happy that we have continued to remain in contact and become friends over the years. Unfortunately, I never had the pleasure of serving with Mike but it has meant a great deal to me having the opportunity to carry his stone at BSP 2015. . Mike was said to be a steady force and the epicenter of the family of Maine Soldiers during the 2004-2005 deployment to Iraq. 1SG Jones has been quoted as being the most seasoned, most respected NCO. Experience and respect are two of the most revered accolades that I feel can be bestowed upon a leader. It is mentors like your husband that leave an eternal mark and shape fellow Soldiers to become great leaders. I want to thank you for entrusting me in carrying Mike’s stone and to honor your family. It was a privilege and a memory that I will hold onto forever. Todd gave me Mike’s stone the day before I left for Cerro Azul, Panama for a three day run I had planned there. I kept the stone wrapped in my Afghan scarf the entire journey, which included my passage through the TSA at the Portland Jetport. I know Mike was an Iraq veteran, but I wanted his stone to be wrapped in a soft material that had seen combat, as he also did. When the TSA pulled my ruck sac because it had a stone in it the TSA supervisor wanted to know why I was carrying “a rock” to Panama…remarkably, a former 133d soldier and Iraq veteran (I apologize for not catching his name) now serving with the TSA came over who recognized me and I explained that it was NOT “a rock” but a memorial stone for MSG Mike Jones and I was carrying it for The Summit Project…the 133d veteran vigorously defended my need to carry the stone as the supervisor said it could not be carried aboard my flight. She relented under pressure and I passed on to board the flight and arrived in the mountains of Panama 24 hours later. The first day’s run was an assent to the “Lookout Point” of Cerro Azul (blue mountain) where I posted many pictures of Mike’s stone with my bible and rosary. It was my first assent over 5,000 feet elevation since my stroke recovery and I had to go slow with a walking stick due to my ongoing vestibular function deficit. I sat at the summit for over two hours and prayed, thanking the Lord for this remarkable soldier and all the lives he influenced through his service. I also thanked God for your friendship and service as the Executive Secretary of the entire DSCOPS and HRO families. You have saved me personally many times and always inspired me during my travails as a solider, single father and Unity/Burnham boy. Despite all the ups and downs of military service, you have been the constant (the rock) of our military family with your kindness, amazing administrative expertise and frankly, the love you pour on us as the matriarch of our service. Mike was blessed to have earned your eternal love and one fine day you will be reunited as I am sure your steadfast Faith promises. The second and third days of running were as difficult as the first with the early arrival of the rainy season washing out most of the trail system, but I was able to log nearly 35 miles over the mountainous terrain and felt blessed just to be alive and able to run at all in the 90 degree heat. It was a pandora of beauty as I stopped often to contemplate my journey and the stone in my running pack. I often saw the enormous, translucent Blue Morpho butterflies lofting in the canopy of the jungle and was reminded of how we all change over the course of our lives with the passing of time. The jungle teems with life and renewal with each season. I am proud of your own renewal and the blessings you have heaped on all of our plates as your friend, colleague and the legacy of your soldier, husband and father of your children. I hope to see you soon, and will always be thankful for this experience and the honor of carrying this stone to Central America and over the soft paths of Cerro Azul…a place so beautiful it defies description and where I feel more close to God as the creator of such splendor than anywhere else on the planet. Thank you Jack… Your letter is beautiful…. My name is Andrew Hagerty and on 10.17.15 I had the honor of carrying the stone of US Army 1st Class Mike Jones up Cadillac Mountain as part of TSP at ANP. I had only recently heard of the Summit Project, but was intrigued about a living memorial that honors and keeps alive the memory of our fallen. Mike’s stone was actually a last minute add for me as I was slated to carry the Courage stone. Honored to carry it as well, I started learning about Mike and what kind of man and leader he was. It didn’t take long to realize how perfectly the two stones dovetailed. Mike Jones was the epitome of courage. A 43 year old husband and father who deployed to Iraq even though health problems would have excluded him. A man quoted as being the most seasoned, respected NCO, who led his unit through many construction missions under dangerous conditions, who earned a bronze star for his outstanding performance and leadership. I look forward to telling my young boys the story of US Army Sgt. 1st Class Mike Jones and how this courageous man from Maine helped make our world a better place. One February 27th of this year me and my cousin and a few others from the South Portland Boys & Girls Club took a 2 hour walk around South Portland and finished at the Veterans Monument. We all took turns reading our soldiers and their lives. I was honored to carry Army SGT 1st Class Michael D. Jones stone and speak about his life. He gave up a lot of this life to make sure our lives were FREE from war. After graduation I am going into the Coast Guard like my uncle Dwyane to help our county too. Thank you for letting me get to know your son. Thank you for entrusting TSP with a special stone, a stone you chose from a garden your husband Michael made for you, at the home you shared in Unity Maine. I had the honor of carrying his stone and his story on a tribute march in Newport in April. Although I have been involved with TSP for a few years, this was the first time I carried a fallen soldier’s stone in a TSP march. I did not realize how emotional and life changing it would be. Michael D. Jones was born March 11th, 1961. He was a graduate of Mount View High School in Thorndike, and joined the Maine Army National Guard in June of 1978. I learned that the military was extremely important to Michael. He was recognized for his outstanding performance and leadership with many awards, including the Bronze Star. A fellow soldier, Tim Vachon, described his NCO as caring, fair, and willing to give you a second chance, a respected leader they nicknamed “Skipper.” Michael believed in his job, to train his soldiers, complete their missions and get them home safely. He succeeded in doing this. Michael married his sweetheart, Lori, in July 1980. They were about to celebrate their 25 wedding anniversary, when he passed away unexpectedly on March 3rd 2005, only days after returning stateside from a deployment in Iraq. They had three children, Amy, Adam and Alissa. And in December 2001, Michael had become a grandfather when his granddaughter Kaylee was born. He loved her dearly, and she was his pride and joy. Lori, thank you for spending extra time with me, sharing so many memories of your husband Michael. He was a loving husband, father, grandfather, and also cared deeply for his soldier family. He was brave, kind, a lover of stock car racing and a man who liked to stay close to home. He wasn’t one to complain, even when he wasn’t feeling well. Not only did I learn what a strong person Michael was, but I also learned how strong a woman you are. You carried the weight of the world for your family. Lori, know that I will continue to share Michael’s story with others, and carry on the mission that Maine Heroes are Not Forgotten. Also know you have gained a lifelong friend. May your days be filled with sunshine, beautiful flower boxes and may your cardinal always be near. 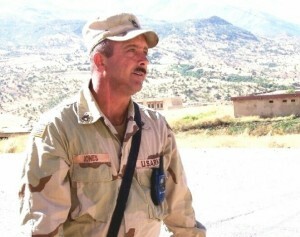 I served with SFC Jones, a good man, soldier, and leader. He is missed and frequently in my thoughts. I am motivated and inspired to keep serving by those, like Mike, that gave all and no longer can. It is up to those that remain to keep moving forward. Essayons! Let me begin by saying Thank You for the privilege of getting to know you, Michael, and for the honor to carry Michael’s stone. The life that you describe Michael lived is honestly one that I envy and he was truly fortunate to have built for himself and your family. The dedication that he demonstrated to his family and Soldiers is inspiring. In the chilly drizzle near the top of The Owl this past Memorial Day, I was nervous, but excited to tell my team about Michael’s legacy. I wanted to make sure that I did him justice. Prior to speaking, there was one word that stuck in my mind about Michael, that word is American. Your description and stories of Michael painted the image of a man that epitomizes what it means to be American. He grew up in a small town in Maine, he enlisted in the military before he was even 18, he married his high school sweet heart, he enjoyed his coffee, his cigarettes, his NASCAR, his war movies, his home, and most importantly his family. Michael’s legacy has served as a reminder to me to get back to the basics. He didn’t strike me as the type of man that needed many creature comforts or materialistic things. It’s easy for all of us to get caught up in life, he will always remind me to be thankful for my family and friends. Michael, I never had the pleasure of knowing you. Had I been given that honor, I picture the relationship that most will never understand or see between a young naive Officer and a seasoned First Sergeant. Your life has shown me how to be a better person, and although I’m not a NASCAR fan, I’ll be thinking of you each time I see it on. You will never be forgotten, thank you for living a life most of us can only hope for, a life full of love and family, a life of service, a life that we all strive for as Americans. I am very grateful for the opportunity to have hiked with Michael’s stone. I have been waiting for the chance to spend time with him and share some memories. I hiked with team Blackwoods at TSP at ANP on 1OCT2016. Our team was comprised of 18 hikers some military but most were civilians taking the opportunity to show their gratitude for the sacrifice of our service members. I got to hike with some old friends and some new ones. The highlight of the hike was our stone ceremony at the summit of Cadillac Mountain. I enjoyed talking about my relationship with him and talking about who he was as a man and a leader. I even got to tell my favorite story about him. The toughest part of the day was the ceremony at the end of the day when I had to hand Mike’s stone off. Fortunately Angel and Betsy were there to make the transition smooth. The Summit Project is doing a fantastic job helping to keep Mike’s memory alive as well as all the others. I recently went with my 11th grade English class to hike up Streaked Mountain with the rocks of fallen soldiers. I had the honor of carrying Michael’s stone and saying a piece about him and his life at the top. I didn’t know much about Michael, but I think he would’ve enjoyed the view from the top. The trees were just starting change and it was really pretty. I enjoyed the hike up the mountain. I struggled a little with how steep it was, but when I was about half way up I realized that the incline wasn’t as bad as what Michael had endured while he was serving our country. I didn’t know how much the 133rd Engineer Battalion did to contribute to the war until I learned about Michael. I realized that it’s a big and important job. I would like to thank Michael, for sacrificing his life to protect our country and the other men and women out there fighting too. I had the Honor of carrying Micheal’s stone on the Motorcycle convoy from Portland to Millinocket on May 27, 2017. A ride I will remember and carry with me forever. While his stone was tucked safely on my motorcycle his spirit was riding in my heart. Feeling the warmth of the sun, the chill of the wind, and the freedom of which he fought to secure during his years of service. After arriving at the campground and stepping up to hand Micheal’s stone over, I was humbled by the life, the experience, the ride, and could only manage to whisper a few heart felt words. I can only try to express the gratitude I have for having been given a chance to be but a small part of his story by keeping his memory alive with me in all that I do. The weekend of Memorial Day 2017 will be a moment I will never forget. I had the honor of Volunteering for the Summit Project at base to help any way I could for our Amazing hikers and Gold Star families. About a week and half prior I received an email to ask if I wanted to carry a stone around camp. Of course, I jumped at the opportunity. I was chosen to carry the Stone and the Story of Army 1st Class Michael Jones. I did some research and while I did find out some things about Mike I just didn’t feel it was enough so I asked how to reach out to his family and I got an email and a phone number for his wife Lori. I was nervous contacting her but once we started talking I felt so comfortable. I got to hear some great stories and realize our lives were very similar. Mike was a Nascar Fan and I have been a Nascar fan for many years. We liked similar old timers and even some of the newbies…. He was a Truck Driver in his civilian life just like my husband. The quality that I loved hearing the most was how much of a family man he was. He loved his mom dearly and all his siblings. He Loved his Wife and Children but His Great Love was his 1st Granddaughter. His great sense of humor was admired by all. He and his wife bought a home right near all of them and he loved to be home hanging with them all hunting, fishing. I Loved listening to Lori talk about how he was a Junior in High School 1978 when he made the decision to defend our Country and around that time is when they started dating. They had 3 children and had his first Granddaughter (who was 3 when he was deployed). He had an Amazing Career in the Army and was never deployed until 2004. I had the privilege of carrying his stone with me throughout the day at base camp but also had the honor of going on a spirit hike around the grounds with the Gold star families who stayed at base. I felt a connection with him hiking through the woods knowing he would’ve loved the scenery and surroundings. It was very peaceful having Mike’s stone with me and I took some photos that I shared with Lori of Mike’s stone with the backdrop of Mt. Katahdin. This family I will never forget. Having the distinct Honor to have climbed the North Trail of Cadillac Mt. this fall with Michael’s story and stone was an experience that was multiple in emotions and honor for me. The parallels of Michael’s and my life I found out were similar in many different ways. From his love for his family, his appreciation for the outdoors, to his loyalty and accountability to his comrades, and throughout his time here was exemplary. This was my first journey with “The Summit Project”. My wife and I participated in the “Katahdin” ceremonies for the first time this past year just to see what it was about and we were deeply moved. We were able to climb together with Michael’s stone and our own son’s for the first time. As we climbed we spoke of the honor and humble feelings we felt towards all who participated in this event and the lives represented by the stones we carried. Lori, even though we did not meet I was able to speak with Andrew at length about Michael to further gain insight of his life, the respect and honor he brought to all. As I stood on an overlook at the Summit with my wife, our son’s and Michael’s stone on a gusty ridge, the fog blew by and the sky opened up to shine on us. Words were silent, and we embraced each in a moment that will forever be imprinted on our lives. We wish you a calm and safe journey for you and your family throughout your lives and thank you for the opportunity to honor Michael. As a result of this experience my wife and I intend to get involved in “The Summit Project” to honor Michael and all who have made the ultimate sacrifice to our country. This adventure started back on 7/21/17. It was such an honor to have been invited by Lori Jones to carry her husband, Army Sgt 1st Class Michael D Jones’, memorial stone. On 8/13/17 our journey together began in Patten, ME after a special transport from southern Maine. A common theme of family developed throughout our adventures. I learned from Lori that Michael was a home body; he loved to be home with his family. I did not have a specific plan on where Michael and I were going to go. As it turns out he really showed me the way. It seems only fitting that I received his stone as I was joining friends, coming together as family, to support a dear friend as she laid her mother to rest. During my stay at the Harris home I shared Michael with them. They day before they had held a fundraiser ATV event in honor of their son Dustin Harris for Wreaths Across America. During the event Lorna had found a painted rock with an eagle on it. I thought it was the neatest thing. I had heard about painted rocks, but this was the first time I had seen one. When I was heading home I stopped at “the most beautiful overlook in Maine”, with an amazing view of Mt Katahdin. I thought it would be cool to get a picture of Michael’s stone with Katahdin in the background. As I was positioning Michael’s stone on the fence post I looked down to find a small rock to prop his stone at an angle. When I looked down I saw a rock that had writing on it, I turned it over and found it was brightly painted orange with flowers all over. I could not believe I had found this happy rock right there with Michael. I used it to prop up his stone to get a good picture with Katahdin in the background. This started my research of these kindness rocks. I bought supplies, gathered rocks and painted about a dozen to be hidden around my town of Newport. I brought Michael’s with me when I hid the rocks around Newport; we ran into an old neighbor with her grandkids, who were looking for hidden rocks. Our journey continued with family at the core; which I am sure would have pleased Michael. We attended the housewarming of a sister hiker and friend. Shared a quiet morning with coffee, just Michael and I. We honored Michael at Dragonfly Farm and Winery with friends, who are like family, visiting from Kansas. Had coffee with a very special couple in Newport before heading to the Central Maine Jeep Owners Jeep show where Michael had a place of honor at the Veteran’s Service Committee table for the Waterville Elks Lodge. Later that same day we went on a Jeep trail ride with Michael riding along. Michael was the guest of honor when we had dinner with friends in Bucksport and then enjoyed the Eric Church concert in Bangor. During our time with Michael I did not have a specific hike planned and then we ended up going on two hikes together. The first was to the summit of Chick Hill in Clifton, ME. This was a little prep hike to get back into the groove before my husband Derek hiked in October with The Summit Project. It was so good to get out and about with Derek, we needed our family time together. As we were closing in on the summit we both smelled bacon. At the summit we found some campers preparing breakfast after watching the sunrise. They asked about Michael’s stone as I removed it from my pack. Again we shared Michael and his story. They thanked us for honoring him and sharing who he was. Since Derek was going to be hiking as an Assistant Team Lead on Team Bubble he wanted to conduct a pre-hike to get to know the trail. On a gorgeous October day we hiked up the West Face trail to summit Cadillac Mountain. It was a special honor to have Michael with us on this challenging adventure. When we went to get a treat from the gift shop Derek suggested a brownie but I said lets get a whoopie pie instead. I’m not a big whoopie pie fan, but thought it was a better choice. When Lori saw our picture we posted she shared that Michael liked whoopie pies. Little things like this happened all through out our time together. As our time together was coming to an end and I would be transporting Michael’s stone to the TSP @ ANP event I brought Michael to work with me. Again I shared my morning coffee with this hero. Because I was in a hurry to pack the truck that morning with all our gear and carpooled together I had not had breakfast. When I got to work I grabbed a Pop-Tart from the vending machine, a good source of seven vitamins and minerals. Lori said Michael enjoyed Pop-Tarts too; his favorite was plain blueberry. I appreciate these little connections that happened throughout our journey together. It was special to have Michael join us in our day to day lives and adventures. The value of family and framily time resinated during our time together. As I was getting prepared for volunteering at base camp for TSP @ ANP I thought why not bring my supplies to paint kindness rocks with the kids at base camp while the hikers were on there mission. I couldn’t have been more excited to bring this to the Gold Star families and volunteers. It was more magical and joyful than I could have imagined. Several kids and a few grown ups joined in to paint. It was a beautiful, heartwarming sight to see them creating new pieces of art and even more exciting that they could not wait to hide them. The kids kept busy finding and reminding the rocks all day long, until it was too dark to see. So many special moments happened throughout the day involving these kindness rocks. One that I want to share as part of this reflection really brought it home. A group of Patriot Riders had arrived mid day. As one of the riders crossed the field to join us at the tent he stopped halfway, bent down to pick something up. In his path, in the middle of this big field, was one of the kindness rocks I had painted and the kids had hidden. It was the rock I had painted FAMILY on. The feelings, the emotions are too much for words. It couldn’t have been a more magical moment witnessed by so many. A message of why we were there; for family, supporting families, honoring families, becoming family. Thank you Michael for helping me find my first kindness rock and bringing me on this journey filled with family, friends and spreading joy. Thank you Lori for sharing stories about you and Michael; about the loving, family man he was. It was a great honor to share him with others. I could not think of a better way for our journey together to come to a close then by being given the privilege to except Michael’s stone in the circle ceremony on your behalf. Sharing Family, Love and Joy. Remember and Honor; not forgotten. Thank you so much P.J. It truly was such a wonderful feeling to see you share your adventures and having Michael there with you. You my friend are a very special lady and your commitment to sharing the lives of our fallen heroes and their stories is a wonderful thing. It truly means a great deal to the families. I would be happy to have Michael tag along with you anytime! Words simply cannot say what a moving and amazing experience it was to carry Michaels stone with me on November 11, 2017. I had the great opportunity to not only carry one stone, but two stones that day as Michaels stone was a late addition for our group as we climbed Blue Hill mountain. As an employee of Mount view elementary school for the past 12 years, you can imagine my surprise as I read Michael’s story and learned he also graduated from Mount view high school and was a resident of Unity where I have spent so much of my time. We always say that there are no mistakes with the summit project and stones ” fall into the lap” of the people who are destined to carry them. This was definitely the case with Michael’s stone and myself. As I carried his stone with me on our journey that day, I was reminded of the connection that we share – knowing the same community and the same area so well, me serving in the same school where his grandchildren attend and his sister also works just feet from my room. I was reminded of how his stone was chosen from the family garden that he made. I was reminded that, even though he was sick with Illness, he still made the choice to go and serve his country and how soldiers looked to him for teaching and guidance and what a true hero that made him. The most moving part of this entire experience was getting to meet you, Lori, and realizing that we work with in the same building. Thank you for the opportunity to carry Michael’s story with me that day, and I will carry the experience with me for a lifetime. God bless. There are really no feelings to describe how I felt when I was asked to carry Michael’s stone. I could not say yes fast enough. It’s always been something I hoped I would be chosen to do. It was a cold day but so beautiful. I try and attend the Veterans Day race every year. It’s a tradition a few close friends and I share. We encourage each other and we are so proud to support such a wonderful cause. I was not only saying yes to carrying the stone. I was saying yes to honoring Michael, to honoring all fallen soldiers and to honor and represent this great country and what we stand for. It brought me back to my own husband’s year long deployment in 2016. It reminded me that he was deployed at that moment and how I could not wait till I see him in January to tell him all about Michael. I wanted to learn about Michael and his story. As I learned more and spent more time with his stone I became inspired and continue to be inspired. His dedication to his country and his family were unshakable. He was the same age as my mother and he lived in Unity where I always tell my husband I want to retire! It’s so beautiful. I carried his stone with me that day and will continue to carry it in my heart the rest of my life. Thank you for allowing me the honor of carrying Michael’s stone and learning some of his story and your memories of the love of your life. It was my 2nd hike with The Summit Project but my first hike on The Owl at Baxter, or any hike this long and high in many(30 or so!) years. Initially, after the hike, I kept describing it as a gentle, meandering path through the woods with a rushing brook alongside. As we slowly made our way up, the brook became waterfalls. There were huge boulders in the woods as big as rooms, taller than the ceilings. Some of the boulders had trees growing on them, lightly tethered to moss carpets yet they grew big and tall. It was a beautiful scene to carry the sweetness of your memories through. Nearer the top we had rocks to climb up over until we reached the edge of the sky upon The Owl and there we let our stories take their flight as we each took turns telling about the heroes that our stones represented. As I walked up, I often saw pictures in my mind’s eye of Michael sitting in his room while deployed; entertaining and engaging the younger soldiers who would often “congregate there to solve the world’s problems”. I read that he was a seasoned and experienced Army National Guardsman who they all looked up to and went to for advice. It melded with the stories of Michael on the home front taking the same care to train up and share life with the younger set within his family in Unity. You shared that he was his kid’s best friend (not necessarily the disciplinarian!). He often spent his days off from work, coaching sports, teaching his children to drive, nieces and nephews included. I loved that he would go pick them up at school and go to their sporting events. That is a picture of a fulfilled life to me and I appreciate the respect for this man that grew during my time getting to know him here amongst others who had carried his stone before and who had worked with him and called him friend. When I read that he liked being home, I thought that meant never adventuring, but as his story unfolded I saw that he had great adventures; hunting with his Dad and brothers, even his own children as they were old enough, camping with them when they were younger, being a great uncle and father. I can only imagine the stories he’d tell. Hiking on The Owl seems a far cry from the race track roaring, but I could hear it and envisioned the love of the sport that Michael had for it and it sounded like it was a family affair. Some of the things you shared with me were easy to remember because I love blueberry pie too. I should have made that. Instead I tried the never before attempted, No Bake Cookies. After a few days they held their shape! I could easily imagine the ribbing I would have taken if Michael had tried them. That was the picture I was seeing of the man you described with his sense of humor. I had back stage passes to Guns and Roses back in the early 90’s. They played in Augusta. Since Michael liked them, maybe he went to see them, too. At the top I shared these things with our team, the dates and details about his service to our country and they laughed when I told of Michael teaching his 10 year old to mix his favorite drink! In retrospect the hike that seemed so gentle and easy was an illusion (I’m remembering some major huffing and puffing on my part now) because I was watching a story of young love that blossomed and grew into a life well lived, full of love and adventure, full of family and service to our country. Your whole family served our Country by providing a home base of strength, comfort and love for your husband, a father and soldier, Sgt 1st Class Michael Jones, United States Army National Guard. I honor you, Lori, Amy, Adam and Alissa. Your memories shared showed me the joy in your lives. I’m sure Michael’s name is mentioned somewhere in Unity, the state, and different parts of the nation everyday by those who knew him and knew of him. He is not far from all your hearts and now mine as well. I was honored to carry Michael’s stone and I hope to carry his stone in the future on next year’s summit climb, so I can share his story and his legacy for years to come. I felt that the Summit Project gave me an amazing opportunity to hear the stories of some of Maine’s fallen hero’s which I most likely would have never heard elsewhere, and helps to spread the legacy of these fallen service members which without the Summit Project may have been forgotten. I look up to SFC Michael D. Jones, and after reading his story I have become interested in joining the Maine National Guard. It is an honor and privilege to be assigned the stone of Army National Guard SSG Michael D Jones for the 2018 TSP at ANP hike. My first hike was in 2016 and I had the honor and privilege to learn the story of CPL Josh Barron. It was my first TSP event. It was amazing and ever since I’ve tried to convince my husband and son to join the mission. When I received my email communicating I had the opportunity to return in 2018, I quickly gathered the family to plan a long camping weekend. A few weeks later I received my stone assignment, SSG Michael D Jones of Unity Maine. A familiar name but a new story for me to learn; my next step was to connect with his family. This was my first call to a Gold Star family member as previous stone assignments let me off the hook easy because family wasn’t available. Every possible excuse to avoid was considered but I stood up tall and made the call because it was the least I could do after their sacrifice. SSG Michael D Jones’s wife, Lori Jones, graciously accepted my call and we chatted about how they met, his service, his interests and the family they built. We hung up and I started to ready my family to depart the next morning for ANP. We arrived in ANP on Friday afternoon and set up camp at Smugglers Den campground where the TSP at ANP event is held. Local family came to visit and we enjoyed family time together. The next morning I left the campsite at 6AM to head to the TSP basecamp tent to meet my crew and obtain SSG Michael D Jones’s stone. At basecamp I found old and new TSP friends. It was very much like a family reunion. I was anxious to meet one specific teammate, Lynn Barron, gold star mother of CPL Josh Barron (my hero from 2016). While somber to know she was carrying her son’s stone it was amazing to see the strength and determination to give it a try. We soon departed on the buses and upon arrival at the trailhead started our hike. It was an easy hike on a sunny day. We stopped often to enjoy the views on Bar Harbor and the cruise ships. We also took the opportunity to get to know each other. One of my favorite parts of the entire event is to see the American flag being carried up the mountain and over the summit. On this day, our co-leader carried the American flag a majority of the hike but handed it off the Lynn as we approached the summit. At this point Lynn received her trail name – Mumma and we happily followed. At the summit we gathered to share our heroes’ stories. My tears flowed without concern or embarrassment. I told Michael’s story … but forgot to share how he passed. I didn’t let the regret linger too long because his life is the message and not how he left it! We departed the summit on buses, returned to base camp at Smugglers Den to participate in the final ceremony to hand the stones off to the family or TSP volunteer. Afterwards we enjoyed a dinner so I took the opportunity to return to my family at our campsite. I tried to entice my family to return to the dinner with me but local family was visiting so I returned alone. Eventually, my sister in law came to the basecamp tent to let me tell her about TSP. I met up with my Gold Star cousin and uncle and we enjoyed time chatting. Then I glanced up to see my son standing in the basecamp tent. He finally came to check it out…..well not really….he just wanted to show off his hedge hog but it still got him closer to being TSP family!!! A small step but I’ll take it! At the end of the day our son left for a cousin sleep over and my husband finally ventured down to the basecamp tent because it was on the way to the bonfire. We enjoyed amazing conversations at the bonfire and my husband actually said he regretted not being part of the event that day. WOW. Another small step but I’ll take it! The following day was spent with local family watching football and eating good food at our campsite. So why do I tell you all about me, my family and less about Michael? Because the weekend theme was FAMILY. TSP family and friends, local family and absolute strangers came together for one of the happiest, most enjoyable weekends my family has experienced in many years. Michael was all about family time and this is what he offered to me when assigned as my hero and I’ll be forever grateful. Thank you Army National Guard SSG Michael D Jones for your service.